Columbia River Knife and Tool is known for producing quality knives at affordable prices, and the CRKT Drifter is one knife that exemplifies this. The Drifter is a sturdy folding knife that is not all that fancy, sporting a very basic style. 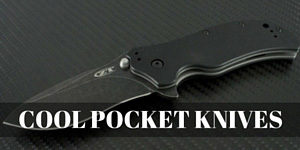 However, it is extremely well built and perfect for an everyday carry knife. For its price range, around $25 on Amazon, this knife has some features that make it seem like it should be in a higher price range. The CRKT Drifter has a 2.87 inch drop point blade with a hollow grind. Sporting decent steel, 8Cr14Mov, the blade will hold an edge, while still being relatively easy to sharpen​ compared to some of the other harder stainless steels. There is a gray titanium nitride finish on the blade, which should aid in slowing rust if the knife is neglected. The Drifter is available in several different models, with various blade options. Models of the knife are available with plain edge, half serrated, and full serrated, which is nice, as everyone has different uses for their EDC knife. All models employ a liner lock, which engages very well, ensuring a solid lockup. While liner locks are not as strong as other locking mechanisms, the Drifter seemed to lock up very tightly, with no play in the blade in any direction. The overall length is 6.5 inches open and 3.6 inches closed. Options for the CRKT Drifter are not just available in the form of varying blade styles​, but also in handle material. There is a model with G10 handles, as well as one with stainless steel. The stainless steel version is heavier, weighing in at 3.2 ounces. The handles are also titanium nitride coated to help prevent rust, but unfortunately, that is the only thing that was done to improve the handle. CRKT marketed the Drifter as a knife that was well built, affordable, and was very easy to customize via adding a customer's logo to the handle. That last point was a major marketing factor for the Drifter, so I understand why the handle is very smooth, but it still can be a problem sometimes. With wet or dirty hands, it is very easy have your grip slip, possibly risking an injury. The ​G10 Model has scales that are made of textured G10, with the only steel in the handle coming from the liner lock, which brings the weight down to 2.4 ounces, making this model very lightweight, which is a great attribute in an EDC knife. The texturing of the G10 scales allows a much more sure grip on the handle, with very little slippage. The Drifter has a thumb stud on the blade to assist in opening, and with a bit of oil on the pivot point, opens with very little effort. There is a pocket clip on the handle of all models of the CRKT Drifter, but the only carry position that is possible is right side, tip down. For some, the lack of carry options, especially for lefties, may be a problem. I am left handed myself, however, and I prefer carrying my knives right side, tip down, so it really varies person to person. As I have stated numerous times already, the build quality is fantastic. I expect this knife to last quite a while. In closing, the CRKT Drifter is a solidly built knife, with an affordable price tag. Personally, I favor the G10, plain edge model, but with such a low price tag, it's definitely worth it to check out more than one model. The CRKT Drifter is a knife that will not let you down as an EDC knife.